Vada's Blog Stamp Inks and Paper : Tag Tuesday theme is “Friends”. 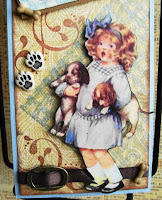 Louise at “Kard Krazy” has chosen “Friends”, for our theme this week. One of my all time Best Friends is my dog. Bandit is always happy, no problems, he just love’s you all the time. Willing to give me kisses, even when I’ve had a very rotten day. He love’s you no matter what. “There is nothing better than to end a bad day covered in “Dog Slobber”. So I found a graphic from “The Graphic Fairy” that I just love. My stamps are from ”American Art Stamps” , TAC and DOTS. Remember to stop in at Kard Krazy and take a look at all the beautiful tags. There’s still time to join us. Would love to see what you create with this theme. Thanks for stopping in, Hug your Dogs. Как красиво получилось! Много красок!Мне очень нравится! У вас замечательный блог! Стала вашим постоянным читателем вашего блога! A lovely tag with wonderful details. Beautiful friendship tag, Vada! Love the vintage image, she is so cute! Have a great day! This is adorable Vada, I love how you layered her too. This is such a cute tag and such a lot of work - well done! 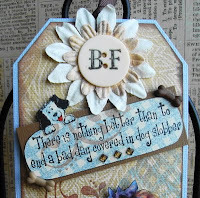 Very pretty and sweet tag, showing appreciation for your faithful dog! Oh my gosh! Your tag is adorable!!! Oh I love this. What a cutie. I also have used dogs and girls/women on my tags. Not posted on Blog as yet, too busy with the OWOH, Kings and Queens challenge and FKP project so it will need to be the weekend. This is just so adorable. It kinda reminds me a little of my Tag.. HOpe you are having a happy day!! This is so sweet. Love the image and the lovely details. Great design. so cute and you've put a lot of thoughts in it.